Dive Journal: Linda and I are ready for one more dive, and so we grab our gear and trek down to the Sand Dollar dock around 9:00PM. 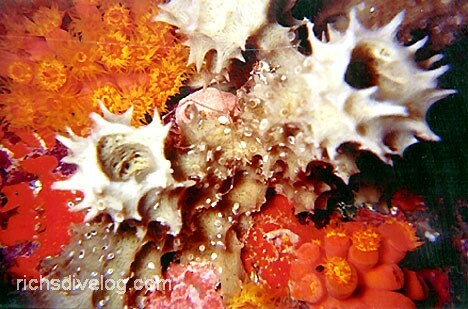 This is another special dive for Linda and me, because it will be our first unescorted night dive. We enter the water and proceed down over the reef slope. At night, the scene is again markedly mysterious, punctuated by the flash appearances of sleek tarpon and snook in our dive lights. As we examine the reef, a curious greyish-blue fellow emerges and begins to follow us around. Wherever I shine my light, he follows and buries his face into various nooks. At one point I even grab his tail just to see what he'll do, but he is quite unafraid. I later identify this guy as a greater soapfish. This name is derived from a soap-like toxic mucus they secrete. At one point, Linda and I are around 35 feet deep and we decide to turn off our dive lights. In the blackness, it is downright eerie and an exercise in sensory depravation. We quickly notice, however, that bioluminescent beings are all around us. Whenever a hand or fin is waved, the bioluminescence glows, and so we start playing with this effect, throwing 'streamers of stars' at each other and creating starry wakes. Before we know it, both of us bob to the surface in the middle of nowhere. The distraction has caused us to completely lose buoyancy control! How embarrassing! Fortunately, our ascent rate was relatively slow (as later indicated by our dive computers), and we descend again to the reef to begin a slow swim back to our entry point. Our dive is only about 35 minutes, but it feels good to complete this dive on our own and intact. It's been another great day in paradise but we are very ready for some sleep.